Teed Up Travel creates specialised tours including sports, special interests and business. We take small groups to the greatest sporting events and arenas around the world. We venture to the world’s most celebrated shopping locations. We help entrepreneurs explore global import and export opportunities and conduct business over the horizon. 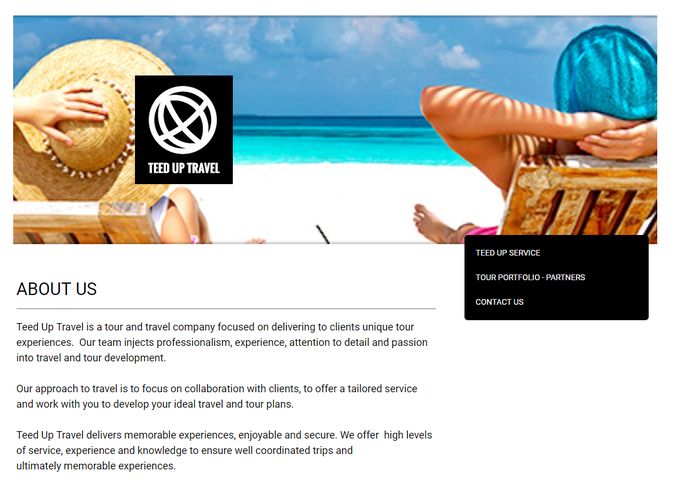 To be honest, Teed Up Travel had a very poor web presence, with little consideration provided to branding, communication, call to action and marketing. After participating in a Digital IQ workshop and receiving face to face advice, we realised there was a need to vastly improve our online and digital performance. We completed a comprehensive digital marketing analysis and then set about completely overhauling our digital strategy. This included developing a new brand, a new website, a social media action plan and the introduction of cloud computing and online meeting tools. Importantly, we also monitor key metrics (such as website traffic) so we can measure the success of our marketing activities. As a result of engaging with Digital IQ advisors we have a much stronger digital brand footprint, with a more purposeful and active digital presence. We wanted to explore ways to grow our businesses via digital technologies and expand our brand across the region, around the state and potentially into international markets, in a cost effective and efficient way. I am certain that implementing a bilingual digital strategy will give us a real advantage as more and more discerning tourists visit from overseas markets.